David Scullion's late goal sends Coleraine through to the Irish Cup quarter-finals at the expense of derby rivals Ballymena United. Ballymena had led through Gavin Taggart but Curtis Allen equalised and went ahead when Shaun Maher netted an own goal. 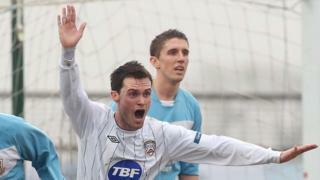 Gary Liggett's first goal in a Ballymena shirt seemed to have forced a replay but Scullion settled it near the end.